When our kids see us disagree on a consequence they have learned that they have the upper hand because they saw that we don’t agree. Because we didn’t agree on discipline they often shopped for answers (they would go to one parent and get an answer and then go to the other to see if their answer was better). Time outs just didn’t make a change in their behavior. The kids actually would “take the time out” just so they could continue on with the negative behavior. 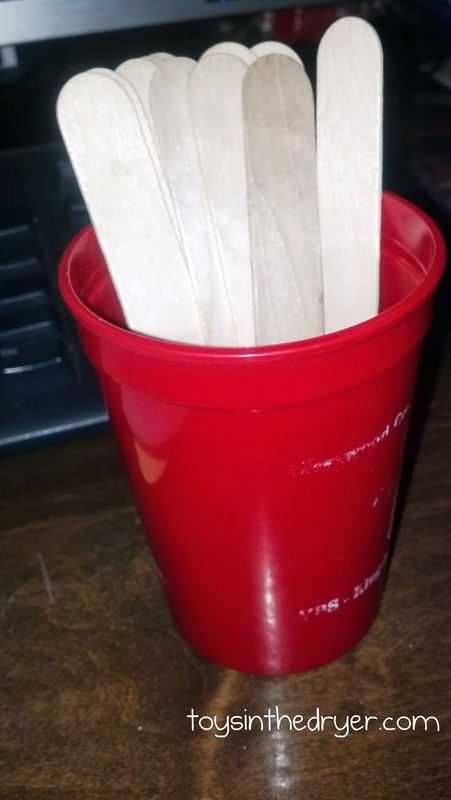 Cue the “naughty sticks!” My husband and I sat down for about an hour after the kids were in bed and discussed a handful of consequences they we both agreed upon. They ranged from something simple like make the beds to more unpleasant ideas like wash out the garbage cans. 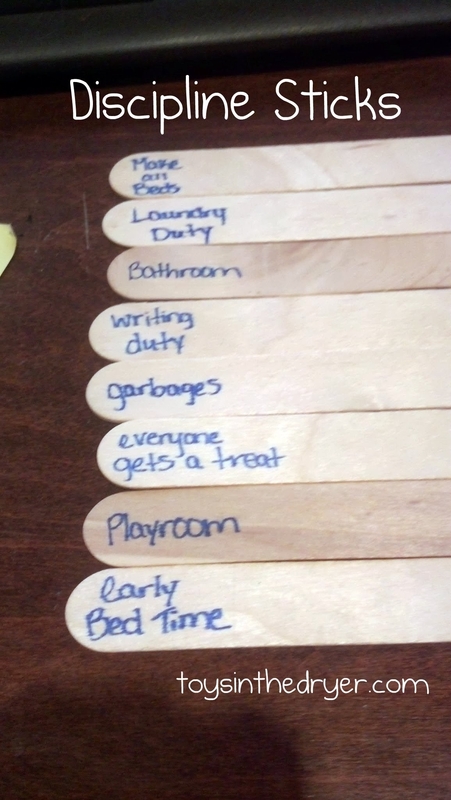 I will share the list of the ones we agreed upon later… We wrote down each consequence in a popsicle stick (“naughty stick”) and put them in a plastic cup. The next day we told the kids the new way things were going to go in our house. We explained to them that from now on if they have a behavior that we do not like and they do not change it they will need to draw from the cup. My kids did NOT like this idea! We didn’t tell them what the consequences were on the sticks for a very good reason….we liked the element of surprise! Instead of my kids thinking to themselves “well, I can continue hitting my sister and all I am going to get is a 5 minute time out” it quickly morphed into “oh no! Not the naughty sticks! I better stop hitting my sister because I just might draw a consequence that I really do not like!” Not knowing what their consequence is has really changed the game in our favor and has helped them think twice before they do something they know they shouldn’t. Playroom- certainly in their top three of most dreaded. They have to straighten up the playroom. Bathroom Duty- this is also age adjusted. I will fully admit this one is my favorite because with FOUR boys in the house you can imagine how our bathrooms can look. Laundry Helper- I will wash, dry and fold the clothing but they will be required to put them all away. Everyone else gets a treat- this one sounds awful but it works fantastic! This is the one they dread the most! I love this idea! 🙂 did it work well?